Tag Archive | "Striped Raphael Catfish (Platydoras armatulus)"
The Striped Raphael Catfish (Platydoras armatulus) is popular with tropical fish keeping enthusiasts and is commonly kept in community aquariums. 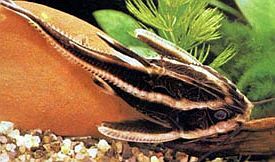 The Striped Raphael Catfish is also known as the talking catfish, chocolate doradid, thorny catfish, chocolate catfish and Southern Striped Raphael catfish. It has a wide range and is commonly found in the Amazon, Parnaiba, Tocantins, Orinoco, Essequibo Rivers in French Guiana and the Suriname of South America. The Striped Raphael Catfish is a burrowing fish that in its natural habitat feeds on crustaceans, mollusks, and organic debris. They like sandy bottoms and have been identified as a “cleaner” for several types of piscivorous fish. It has a curious tadpole like body shape with bold black and white stripes running from front to back that give the Raphael Cat its striking appearance. It sports an impressive set of spines that run along its lateral line and has pronounced, dagger like pectoral and dorsal fins that can inflict pain if mishandled. 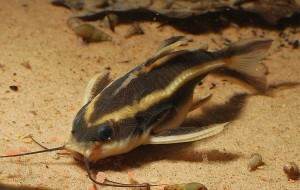 Fortunately the Striped Raphael Catfish is peaceful, curious, inquisitive and full of personality when active, but it is a nocturnal catfish that prefers hiding during daylight hours. Striped Raphael Cats are hardy and very easy to care for. Like other members of the Doradid family of armored catfish, they are “talkers” and produce a guttural type of croak or a series of squeaks when threatened or when they want to intimidate other fish. The Striped Raphael Catfish is mild mannered and does well in peaceful community aquariums of at least a 30 gallon capacity that is well planted and aquascaped with rock overhangs, caves, and driftwood. Since they are a burrowing species, they should be provided a sand or fine gravel substrate to keep them happy. These fish will get along well with both peaceful fish and larger more aggressive species in a well aquascaped tank. Feed Striped Raphael Catfish sinking pellets, live brine shrimp, small freeze dried and frozen foods like bloodworms or brine shrimp. When available for purchase they are anywhere from 2″ to 2-1/2″ in length.